For years, Pharma Companies have invested the lion share of their budgets in promotion to gain share of voice. Regulatory limitations and diminishing returns on investments oblige Pharma Companies to reinvent this paradigm. At the same time, Medical professionals are looking for a more balanced and transparent vision of the claims made by drug makers. This is the reason why continuous medical education programmes have gained so much tractions among medical professionnals. Surveyed Healthcare professionnals surveyed by EPG health shows that demand outsrips supply for digital/virtual events and support tools. "Education needs to be supplied via channels and formats geared towards the unique behaviour of individuals”. This draws a case for the use of Marketing Automation in Medical Education. Timely targeted content delivred to each medical professionnal has become a must have. 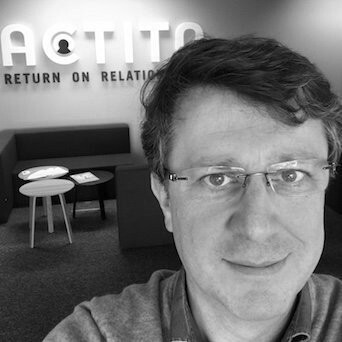 Benoît De Nayer is cofounder of Citobi (holding name of ACTITO and MediQuality) and is responsible for the supervision of all corporate matters and leads ACTITO’s R&D efforts. He started his career as researcher in consumer law at the University of Louvain and as a barrister. He holds a master degree in law from the University of Louvain and a master degree in Tax Law from the University of Brussels.